The launch of the new Scout in Sturgis had to be more than a silly sheet-pull. 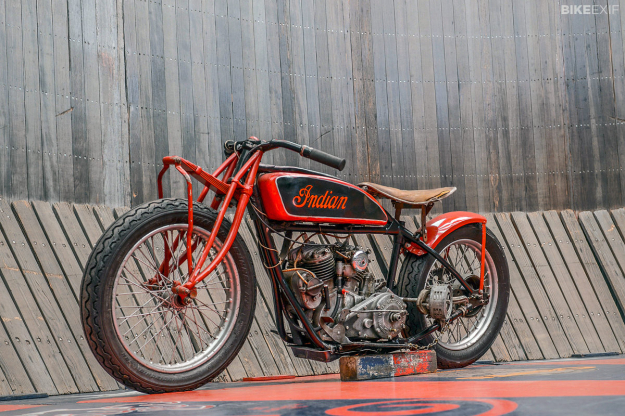 So Indian Motorcycle looked to history for inspiration. 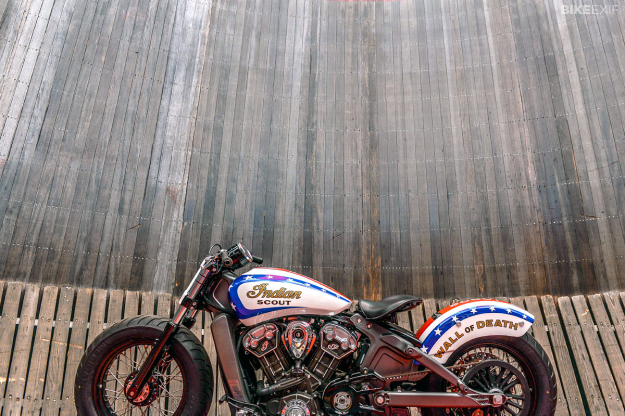 Revealing the bike on a Wall of Death was the answer—with the task of creating a one-off machine falling to Indian’s own industrial design team, led by Greg Brew. 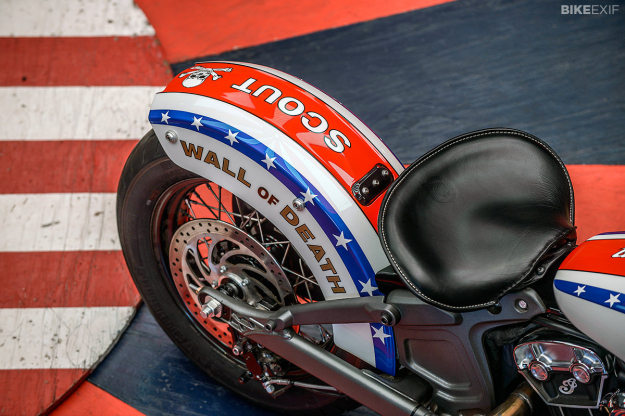 Rich Christoph, the lead designer on the production Scout, is the main man behind the Wall of Death Scout. And it’s more than just a pretty paintjob. 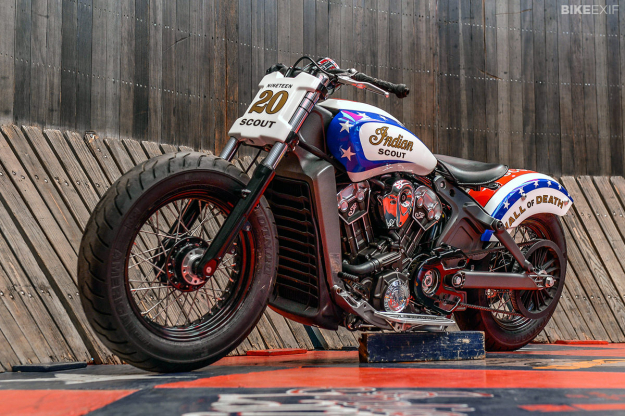 Indian called in Jay Lightning and Charlie Ransom of the American Motor Drome Co. to figure out what mods the stock bike needed—and they’re pretty substantial. Jay and Charlie are used to late 1920s 101 Scouts (above), which have around 19hp. But with custom headers and no mufflers, Indian’s test bike was pumping out a mighty 112hp, and the power delivery was simply too much. So an ECU recalibration was the first item on the list. The solo bucket seat—a styling highlight of the stock machine—turned out to be too narrow for Charlie to manipulate the bike on the wall. So a repro of an early Indian solo seat was created by Minneapolis-based Vinyl-lux, modified so that it could be tucked down behind the tank. After installing it, Indian’s mechanics added a closeout panel under the seat, with a pigtail charging cord for battery maintenance. The stock tank was cut and shut by Jeb’s Metal and Speed before being painted by Indian’s own Steve Leszinski. Other mods are equally practical. The steering stop has been cut off, so Charlie can turn tight inside the ’drome and get a good lean angle. Out back, custom rear struts from Craft Pattern have been installed, so the bike can be set up with a fixed ride height. And with aluminum tubes inserted inside the front forks, it’s effectively a fully rigid frame. After a week-long second test in Wyoming, MN, at Indian’s own engineering center and much to the delight of by-the-book engineers, Charlie gave the Scout the tick. 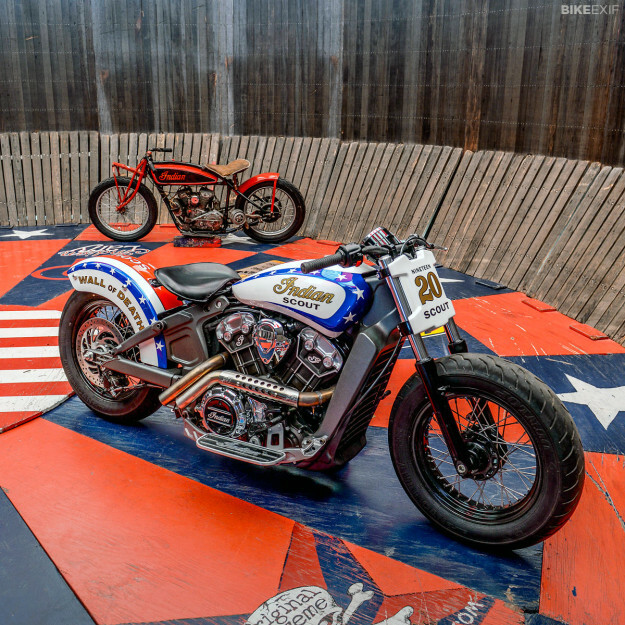 The Wall of Death Custom Scout will appear on the International Motorcycle Shows circuit, and may perhaps perform again. 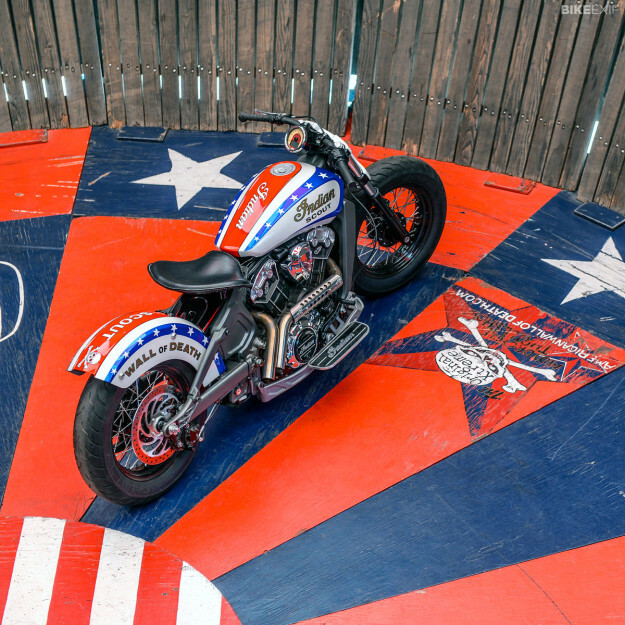 Although it’s a custom, this bike was built to ride—on its side. Mechanical work and tuning by Sheik Ahmed and Chet Michaelson. CAD design by Jim Rogala. Images by Barry Hathaway. 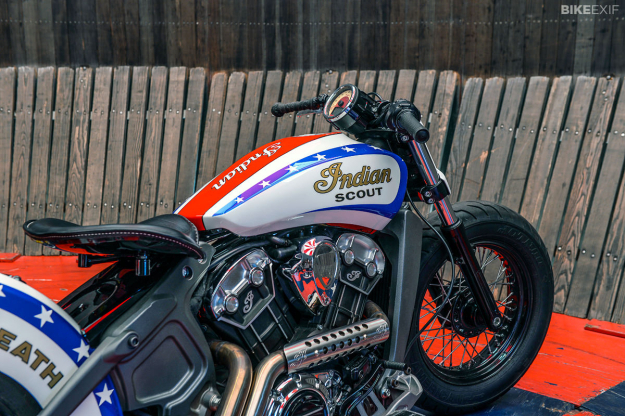 For more information on the new Scout, check out the Indian Motorcycle website.